Bill Watrous rejoins TJO for a special concert of charts from his personal library. March 28, 2015. Temple Jazz Orchestra with special guest Ernie Watts, 'Mary Alice Marshall Performing Arts Center', Temple College, Temple TX, 7:30 pm (Final concert of the 2015 Temple College Jazz Festival). June 7 - 17, 2015 . Temple Jazz Orchestra, with special guest saxophonist Ed Calle. June 7. 'Amarillo College', concert hall, (Washington Street Campus), Amarillo TX, 7:30 pm. June 8. 'Soda Springs Park', Park Avenue, Manitou Springs CO, 7:00 pm. April 2, 2016. Temple Jazz Orchestra with special guest Kevin Mahogany, 'Mary Alice Marshall Performing Arts Center', Temple College, Temple TX, 7:30 pm (Final concert of the 2016 Temple College Jazz Festival). TJO up close and personal--featuring nine originals by Ben Irom, Tim Cates, Sparky Thomason, Dave Wild and others. Stefan Karlsson and Ernie Watts. 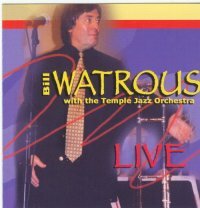 Trombonist Bill Watrous was TJO's guest artist at the 2003 Temple Jazz Festival. Hear Bill and the TJO in this smoking live set. The Temple Jazz Orchestra, founded and directed by Thomas Fairlie, is in residence at Temple College in Temple, Texas. TJO emerged from the natural growth of the jazz program at Temple College between 1990 and 2000. Founded in 1990, what began as a collaboration of students and adult musicians from the area has metamorphosed into the premier jazz ensemble in central Texas. TJO now boasts the best professional jazz musicians and educators from an area surrounding Temple, including musicians from Waco, Killeen, Belton, Austin, San Antonio, Round Rock and other communities. The Temple Jazz Orchestra, its members, and/or small ensembles that have spun off from the group have received recognition at several nationally known jazz festivals, including the UNC Greeley Jazz Festival, the Loyola University (New Orleans) Jazz Festival, the Sam Houston State Jazz Festival and others. The featured band at the final concert of the Temple Jazz Festival for the past 20 years, TJO has performed with Marvin Stamm, Bob Mintzer, Russel Ferrante, Eric Marienthal, Allen Vizzuti, Bill Watrous, John Fedchock, Kevin Mahogany, Gary Foster, Ernie Watts, Lew Soloff, Frank Mantooth, Wayne Bergeron, Gordon Goodwin, Conrad Herwig, Bryan Lynch, Ed Calle, and many others. TJO has also shared the stage on several occasions with the Temple Symphony Orchestra. The Temple Jazz Orchestra was invited to perform at the IAJE Southwest Regional Conference at Baylor University on April 16th, 2005, and performed with Bill Watrous at the IAJE Convention in New York City on January 12, 2007. 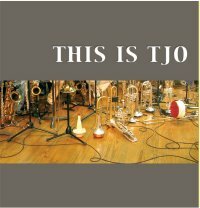 TJO toured Europe for the first two weeks of July 2009, performing at the Montreux Jazz Festival (twice), at the US Mission to the United Nations (embassy) in Geneva Switzerland, at a local festival in Lyon France, and with Randy Brecker at the North Sea Jazz Festival in Rotterdam, Holland. TJO's concert at the Twentieth Annual Temple College Jazz Festival appearance in March 2010 featured guest artists Brian Lynch and Conrad Herwig. TJO returned to Europe in July 2012, playing Montreux, Jazz a Vienne, the UN General Assembly Hall in Geneva, and the Reigen Jazz Club in Vienna. The Temple Jazz Orchestra has released 5 CDs. Two of the CDs joined TJO with frequent guest soloist Bill Watrous, and another features the compositions, arrangements, saxophone and piano of the (obviously) multi-talented Gordon Goodwin. Details of these CDs can be found elsewhere on this page.. NOTE: For the 2003, 2004 and 2005 jazz festivals bassist Ken Wild substituted for TJO's bassist at the time, Steve Layne. Ken, a well-known studio musician from Los Angeles, was also a clinician for the festival. Ken may be heard on the TJO CD Bill Watrous and the Temple Jazz Orchestra..